MoonMarble.com - Filip Vogelpohl - "Blue Wavy Dichroic Vortex"
Art Glass → Contemporary Handmade Marbles → Filip Vogelpohl - "Blue Wavy Dichroic Vortex"
Filip Vogelpohl - "Blue Wavy Dichroic Vortex"
This is a handmade marble by artist, Filip Vogelpohl. 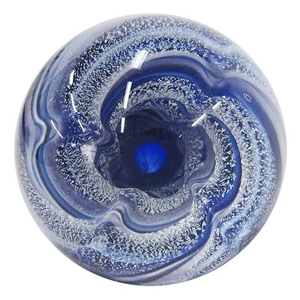 The bands of sparkly dichroic and various shades of opaque blue glass spiral down into a deep blue transparent marble creating a vortex illusion that it is going deeper into the marble than physically possible. The ribbons are pulled inward at four points giving it a wavy design. The back is nicely decorated in a lavender and white petal design. Approximately 2" in diameter.